The Prestige opens in the present day, when a young reporter named Andrew Westley travels to meet Kate Angier, a reclusive woman he first met as a child. Both Andrew and Kate feel that something important happened during that first meeting of theirs long ago, but neither of them really knows how to explain this impression. There’s also the fact that Andrew feels that he has, or once had, a twin brother – a brother whose absence has haunted him all through his life. After this short present-day section, The Prestige moves to the year 1901, and through a series of journal entries it tells the story of Rupert Angier and Alfred Borden, Andrew and Kate’s ancestors. Angier and Borden are two stage magicians engaged in a rivalry that spans decades. The reasons why the conflict between the two escalates to such an extent only become clear as the story progresses. Similarly, the secrets as the heart of their key illusions are slowly revealed. The Prestige is many things: Victorian pastiche, a mystery, and also a science fiction novel, complete with a cameo by Nikola Tesla. The ways in which Priest’s novel is science fiction are not at all obvious at first, but they become clearer as the narrative advances. Litlove noted in her review that their sudden introduction was jarring, and many of the commenters agreed. This might very well have also been the case with me if I’d been caught unaware, but because I remembered this discussion, my reading experience was improved – one more reason to be grateful for social reading. It took me until the section with the journal entries to truly get into The Prestige, but once that happened I was well and truly hooked. I love this kind of smoke and mirrors story; a story in which the puzzle pieces are hidden in plain sight in the language itself; a story in which the reader and the writer both know what the secret is, but the answer is nevertheless not openly acknowledged. This creates a different kind of suspense, where it’s less about finding something out and more about the implications of said thing, or the consequences of it being known by others. In this sense, The Prestige reminded me a bit of Mary Elizabeth Braddon’s Henry Dunbar (and of Victorian Sensation in general, a genre to which it is clearly indebted). Part of the appeal of The Prestige is the fact that its atmosphere is eerie, unsettling, and clearly based on a kind of aesthetics I seldom fail to respond to. It’s also a very layered story, which explores the consequences of shaping your whole life around a single idea or goal, and makes good use of all the metaphorical resonance surrounding the idea of the double. Having said this, I feel more of a cold intellectual appreciation for The Prestige than I do any genuine fan love. But that may very well be down to the mood I was in when I read it. 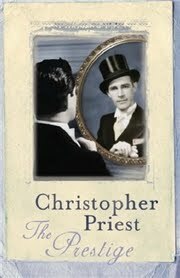 This is a very skilful novel, with a particularly memorable final scene, and it makes me want to read more of Priest’s work. I have not seen the film. Should I? I hadn't read the book when I saw the film so, although I wouldn't describe it as anywhere near a good film, the twist at the end boosted the rating in my eyes. Not sure how much you would enjoy it once you've read the book though. I've watched the film The Prestige mainly because it had Hugh Jackman in it! It was an ok film, so maybe worth reading the book next. When I visited Boston last fall, Marie used some powerful verbiage to describe this book, making it almost undeniable. I must read it. I felt the same as you - I appreciated the book, but the way the narratives were delivered seemed so distancing. I never really got to the point where I was longing to continue reading. I was intrigued to see what happened next, but no more than that. And I felt that the whole crux of the book, the trick that Tesla's electricity made 'possible' was completely implausible, so that detracted rather from my enjoyment of the end. But as you say, lots of layers to the stories that did work well and gave the reader a lot to consider in retrospect. Now, you know I like films. I have to say, though, this is one of the rare films that my whole family thought was possibly a little better than the book. We liked the way it simplified some of the issues, and the way it presented the ending. Take our reaction with a grain of salt, remembering that we do not like horror stories, and the book struck us as a bit horrifying. I actually liked the movie and didn't realize it's based on a book. Yes, do see the movie: if nothing else, David Bowie is a great Tesla! I didn't like this book much although I find it interesting to read other people's reviews of it. I guess I didn't like how it started off quite straight and normal and then went more towards fantasy. I haven't seen the film... perhaps I should as I heard that for people who didn't like the book, they preferred the film. It does have Hugh Jackman in it though... and that man can turn my brain into a pool of jelly. I wish I'd seen it now. I enjoyed the film and would definitely recommend it. I wonder if I would enjoy the book more having seen the film first? I saw the movie when it first came out in theatres and LOVED it. Afterwards I realised that it was based on a book, so I got it from my local library. I think I used up all my renews on the book it took me so long to finish. I didn't like it at all - too complicated and boring for me. So I do suggest watching the movie. I saw the movie, it wasn't bad. I didn't know it was based on a book though. Honestly, the book sounds better than the movie thanks to your review. Personally, I enjoyed the film to the point I own a copy. I liked that it focused solely on the Angier and Borden storyline, and it does a smashing job when it comes to atmosphere. It's not bad; you might give it a shot. I haven't seen the film or read the book, but your review appeals to me. I also dated an attorney who was reading it, oh, seven years ago maybe. The idea of reading it stuck in my head back then. I'm a little embarrassed to admit that I didn't know this was a book. I have seen the film twice and it really is fantastic. It's my boyfriend's favorite movie of all time. I think you should check it out! It's very well done. This is one of my keeper books. But it is a cold intellect book and not very warm! The movie focuses on the two magicians and I liked it a lot. The writers chose not to use the modern threads at all. After I looked at both novel and movie several times, I thought that it would have been better to focus more on the magicians, that the book could have been more than it was, that it did not live up to its potential. The movie is not linear so it can be confusing. I read this way back in 2007, after seeing the film. And I preferred the book. I saw the film first, and to be honest I was a little disappointed in it. Like Sandy, some of the things Marie said about this book make me want to go out and read it straight away, but I have been having trouble finding it in audio, which is the format I would prefer. Still, it is on my list, and I think about it every time I go book shopping. Reading this review reminds me of one last avenue that I might be able to look for this book in. Off to check that out now! Great review! I actually liked the movie. I saw it when it was in the theatre and I just saw it again last week. I'm a fan of Hugh and Christian Bale. It's been years since I read the book, but I remember really enjoying it. I saw the movie once. That was enough. It's not bad--I actually thought it was pretty good; both Hugh Jackman and Christian Bale do some amazing acting--but I felt about it the same way you feel about the book: more of an intellectual appreciation rather than any emotional engagement. It's hard to engage with these characters! I saw the movie and thought it was very clever, but haven't read the book. That said, it is hard to get this story out of your mind when reading The Night Circus, in my opinion. The Night Circus seemed slightly derivative based on my knowledge of this book. I have never read this book, but I did see the movie and mostly enjoyed it. I would have to rewatch it to say any more than that because I hardly remember it... I have never felt compelled to pick up the book. I've not read the book so I can't comment on that, but I did watch the movie a few years ago and I have mixed feelings about that. I really enjoyed the bulk of the film, the "smoke and mirrors" as you put it, but I was really bothered by the ending. What I liked about the film was that it was pulling back the veil on this idea of magic, and that much of the illusions can be explained by sleights of hand and other trickery... but then the end sort of threw that whole idea out the window and really annoyed me. But other than that, it was good fun! I saw the film first and really enjoyed it. Very different to the book though. Bowie does not make for a very good Tesla and there are no modern scenes, the film is entirely set in the past. But Bale and Jackman's performances make it worth the viewing if you ask me. I haven't read the book (yet!) but I saw the movie. I liked it, mostly, but my appreciation of it could be summarized the same way you summarized your appreciation of the book. It was a little while ago though, so when I read the book, I'll probably have to go and watch the movie again. I'd seen the movie a couple of years ago and loved it, and I didn't realize it was a book until recently -- I just read it in December! When I started the book I thought it was much better than the movie, which is significantly different. The movie doesn't include any of the present day story. You really can't compare the two because they are so different. I hate to admit it but I actually think I like the movie better. The movie is very much a matter of taste. I saw it after reading the book, and it may be the only time I've thought a movie was as just as good as a book I adored. It's not one of those movies that tries to BE the book, which for me is always really important. I haven't read the book yet. I have seen the movie though, which was enjoyable - but the cold feeling remains, so that must be the same as what the book has that you experienced. I might give the book a try, as I like this kind of novel, though not the cold atmosphere! I thought the film was amazing - gave me quite the shock. Have been meaning to read the book for ages and hopefully will one day soon!